It was during her undergraduate studies at the University of Washington that Dr. Rosalind Ambrose first heard about St. George’s University School of Medicine (SGUSOM). A counselor told her about a new medical school in Grenada, and because Grenada is near her home of St. Vincent she applied and was accepted. 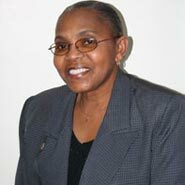 Dr. Ambrose obtained a scholarship through the University from the government of St. Vincent and began her medical education in August 1979. She was among the first of many Vincentians to attend St. George’s with a government scholarship. The School has since entered into successful medical partnerships with other governments who are unable to fulfill their manpower needs through their own internal educational system. While growing up, Dr. Ambrose always wanted to be a pediatrician. This was the case until, in her final year of medical school, she opted for her second choice – radiology. She found working with sick children to be too sad, and believed that her emotions would get in the way of being an effective healer. Upon graduation from St. George’s in 1983, Dr. Ambrose did internship work in St. Vincent and Trinidad. She then went on to do a fellowship in diagnostic radiology at Prince of Wales Hospital at the Chinese University of Hong Kong. She was appointed a lecturer in radiology for two years at the same hospital. Dr. Ambrose owns and operates her own medical imaging center in St. Vincent: the Caribbean Medical Imaging Center (CMIC). She brought the first-ever CT scan service to her home country. They offer full-service, state-of-the-art imaging such as plain film radiology, mammography, fluoroscopy, ultrasound and CT scans, and they also provide teleradiology services to other Caribbean islands. In 2008, CMIC will be ten years old and fully digital, conducting filmless radiology in order to keep up with cutting-edge radiology. In addition to this, she is a consultant radiologist at the Milton Cato Memorial Hospital (previously Kingstown General Hospital). She is a founding member of the Caribbean Society of Radiologists, President of the St. Vincent and the Grenadines Medical Association, served as DME for Kingstown Medical College (KMC) for approximately 8 years, and introduced and lectured ‘Imaging in Clinical Anatomy’ as Associate Professor at KMC. Dr. Ambrose finds her work very fulfilling and credits St. George’s for enabling her to carry it out. During her SGU years, Dr. Ambrose was known as Rosalind Baptiste. She was married in her final year at SGU to her Trinidadian husband, Dennis. Her older daughter, Michaela, was born in Trinidad and recently completed her law degree in the United Kingdom at age 21. Her younger daughter, Gabriella, is 17 and was born in Hong Kong. She is currently enrolled at Green River Community College in Washington State, US.